There is more than one way to read 2016’s market statistics published by Solar Heat Europe about 2 months ago. One could emphasise the great achievements made in reducing emissions and creating jobs in the solar heating and cooling sector in Europe. One could likewise point to Denmark as a leader in solar district heating. A third possibility would be to concentrate on the continued decline in most key markets in Europe and the stark difference between renewable heating targets and their fulfilment in many countries. You can download the 5-page brochure here. There are over 10 million solar heating and cooling systems in Europe. These decentralised solutions are vital to Europe’s energy strategy for meeting heating and cooling demand across the continent. The 34.5 GWth in operation produce an estimated 24.3 TWhth of solar thermal energy while avoiding 6.49 million tonnes of CO2 emissions. 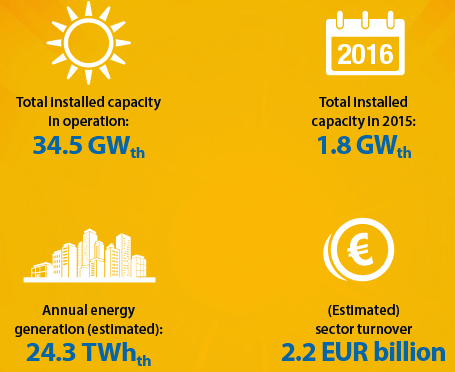 The solar thermal sector generated a total turnover of EUR 2.2 billion in 2016 and employed around 22,400 people. In 2016, Denmark had a record 31 new solar district heating plants come online and 5 plants expanded, seeing 347 MWth added altogether. Partly motivated by the very late extension of the energy-saving agreement between Danish district heating companies and the country’s energy ministry, several utilities completed their solar district heating projects right before the end of that year. The new agreement, signed in December 2016, has allowed the companies to increase the size of systems or start constructing new ones by mid-2018 and still be able to comply with energy-saving rules for the period 2016-2020. Other key solar heating and cooling markets above 50,000 m² have all shrunk considerably in 2016, except for Greece, which remained stable. They are Germany (-8 %), Spain (-12 %), Italy (-9 %), Poland (-58 %), Austria (-19 %), France (-35 %) and Switzerland (-34 %). Please see the solarthermalworld.org links for a detailed analysis of the situation in these countries.